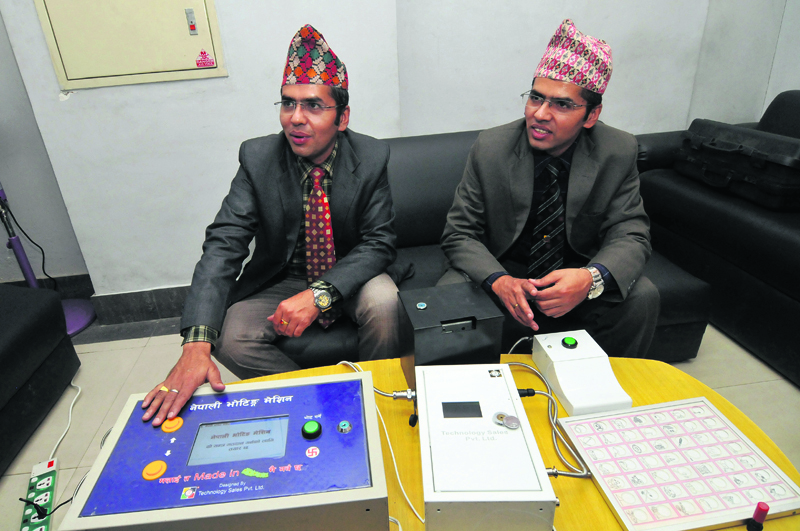 Ram Prasad Rimal and Laxman Prasad Rimal with their electronic voting machine in Kathmandu on Wednesday. KATHMANDU, Feb 9: While the Election Commission (EC) and the government seem to be leaning toward the purchase of electronic voting machines (EVMs) from foreign companies, indigenous developers of such machines have been feeling discouraged for years. The home-grown Nepali Voting Machines (NVMs) are not only cheaper and more voter-friendly, but also efficient in terms of handling the voting process compared to the products of foreign companies, it is claimed. However, the developers have failed to receive any priority from the authorities concerned even though the NVMs have been used successfully in 52 small-scale elections including the parliamentary party elections of the main opposition CPN-UML since the past six years. The developers, Ram Prasad Rimal and Laxman Prasad Rimal, who are popularly known as Ramlaxman, are still willing to take the lead in digitizing the looming three sets of elections. But their hopes of seeing their machines being used are fading fast, given the lack of encouragement from the government and the EC. “We demonstrated our machines at the EC six different times and every EC commissioner since 2012 promised to use our machines,” Ram told Republica. What has hurt them the most is the decision by EC officials to remove their machine from display at the Election Education Information Center, a branch under the EC, stating that it was untested. They have been urging the government to authenticate their machines but their attempts to meet the chief election commissioner and the prime minister are not bearing any fruit. 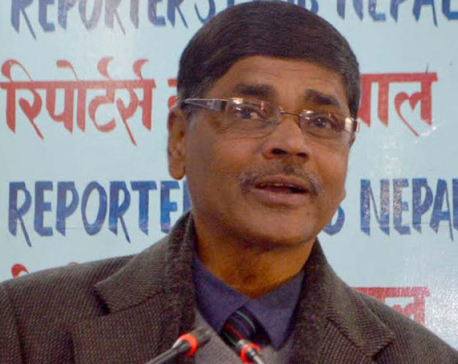 They feel discouraged by the top EC officials at a time when Chief Election Commissioner Ayodhee Prasad Yadav and Prime Minister Pushpa Kamal Dahal are openly lobbying for the purchase of electronic voting machines from Smartmatic, a UK-based company, ignoring pleas to use the indigenously developed machines. Laxman, the other developer of NVM, said they are able to handle the local elections if the EC assigns them to the task. “We can handle it if the local elections are conducted in two phases and we are given three months to produce the machines,” said Ram. They purchase components from Japan, Taiwan and China and assemble them in Kathmandu. “We may have to expand our production but can do it,” he said. The NVMs are rated cheaper and easier to handle. 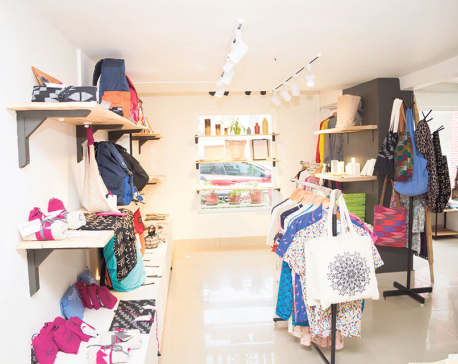 “We can provide the machines at a unit cost of less than Rs 100,000,” he said. With a view to the local polls, they have developed machines which even disabled people can use. A voter-verified audit trail has also been stalled so that returning officers can re-count the votes if any dispute surfaces in course of the vote counting. The developers say the NVMs can accommodate 196 to 800 parties in the elections. The cost for the Smartmatic product is said to be higher than $2,500 and the EC has to pay an additional $1,000 as operation cost. The EC is preparing to purchase 66,000 units of the machine for the elections. Concerns are being raised over the software-based Smartmatic since it requires a higher level of voter education. At Tuesday's demonstration attended by top leaders together with CEC Yadav and PM Dahal, some lawmakers questioned whether illiterate Nepali voters would be able to cast their votes properly. Asked what could be the EC's intention in choosing a foreign company, Ram said he suspected 'monetary dealing'. “We suspect monetary dealing. Otherwise, why are they so hell-bent on this deal, ignoring home-grown options? Screen touch machines are too sensitive and they may not work property in our context where many voters are illiterate,” said Ram. Meanwhile, pressure is mounting on Chief Commissioner Yadav and the prime minister to explore other options instead of selecting Smartmatic without competition. Commissioner Ila Sharma stresses the need of exploring other options while arranging EVMs instead of sticking to a specific company. “We have already tested Indian machines. Our home-grown machines are also available in the market. Why not to use them,” said Sharma.